This article provides an overview of the RC Transmitter and Receiver Systems that can be used with Erle-Brain 2, along with guidance on how they are connected. Erle-Brain 2 is compatible with PPM-Sum RC receivers. For traditional single-wire-per-channel (PWM) receivers a PPM encoder can be used to convert the receiver outputs to PPM-SUM. This RC receiver comes with 6 pin output, one per each PPM channel. As Erle-Brain only accepts PPM-Sum input type, conversion from 8 PPM channel to one PPM-Sum is needed. This conversion is made using a PPM Encoder. This module sums up the 8 PPM channels into a PPM-Sum type, which is supported by Erle-Brain. For more information see the manual and the offical documentation. This connection already done in Erle Kits. 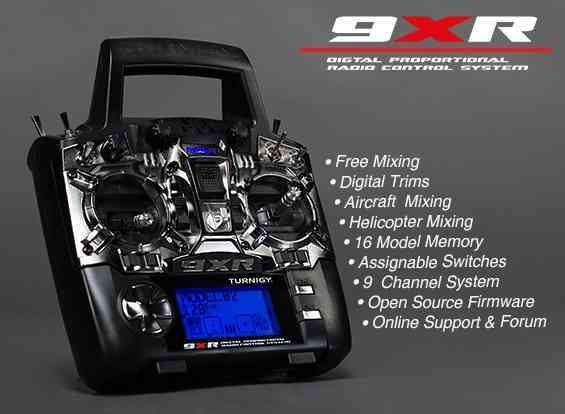 This RC has 9 channels and is highly recommended if you need to control one or more optional components (for example a gimbal or EPM). For more information, check out the manual. In order to connect this module, you only need to follow this official documentation section. In addition to the officially supported RCs, you can connect any PPM-SUM type RC receiver. The FR-Sky PPM Sum Receiver and conversion module below will work with Turnigy 9x, 9XR (above) and other RC transmitters. 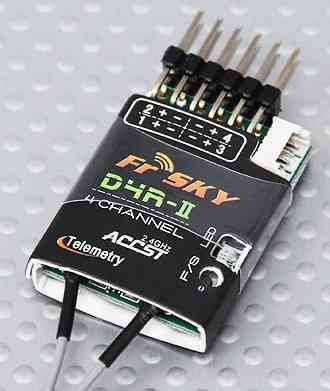 FRSky makes several receivers, only some of which are compatible with PPM-Sum. You can check for compatibility at FRSky’s web site. The receiver shown is PPM-Sum compatible and is recommended (4 channel receivers still do 8 channel PPM-Sum).